People nowadays have a growing access through web sites and printed books to many of the ancient alchemical texts. Unfortunately many people, though drawn to and fascinated by this material, just do not know how to read these texts. They are perplexed and frustrated that they cannot make sense of this material. Adam McLean has now created a one year study course of 24 lessons, which enables the student to read the meaning out of these texts. The first half of the course provides the students with ways of recognising the different types of alchemical text and the distinct approaches one has to take to reading different material. There are a number of exercises for the student to work through and many examples of material for them to study in connection with the lessons. Through this course the reader will become familiar with all the main types of alchemical writings, including works of practical alchemy, cosmological alchemy, alchemical allegories, theoretical and spiritual alchemy. The second half of the course provides detailed line by line readings of a number of texts, including some complete works. This course of 24 lessons is designed to be studied on a fortnightly schedule over a year. By purchasing this course you must agree to use this for the purposes of private study only and not to distribute the course material (whether text or graphics) to any other individual. Lesson 1 : Obstacles to understanding alchemical texts. Lesson 2 : The different types of alchemical works :- The practical. Lesson 3 : The different types of alchemical works : - The philosophical. 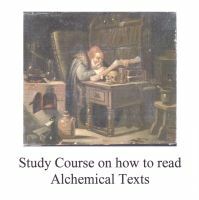 Lesson 4 : How to read texts of practical alchemy. Lesson 5 : How to read coded or obscured texts of practical alchemy. Lesson 6 : How to read cosmological alchemy. Lesson 7 : Works that present philosophical theories about alchemy. Lesson 8 : Paracelsian alchemy. Lesson 9 : The dense structure of alchemical allegories. Lesson 10 : Texts of spiritual alchemy. Lesson 11 : An interlude and summary. Lesson 12 : The Mirror of Alchemy. Lesson 13 : The Lily among the thorns. Lesson 14 : The Terrestrial Heaven. Lesson 15 : The Treasure of Treasures. Lesson 16 : Flamel's Philosophical Summary. Lesson 17 : The style in which a text is written - devices of rhetoric, allegory and supposed biography. Lesson 18 : Treatise of Mercury and the Philosophers' Stone. Lesson 19 : How to read the transmutation stories. Lesson 20 : The devices of allegory, obscurity and paradox. Lesson 21 : Reading alchemical poetry. Lesson 22 : The device of dialogue. Lesson 23 : A sample reading for you to undertake. Lesson 24 : A rant and a summary in place of a conclusion. Please note these lessons are copyright ©2005 Adam McLean, and no part may be reproduced or distributed in any form (including the Internet) without the permission of Adam McLean.